I took the hint and punched the guy in the stomach, then grabbed a nearby janitor's water bucket and slam it on the guy's head, knocking him out cold, just to have the woman behind me yank it out of my hands and do the same to me. I rolled on the floor, and Bandit and Bandit attacked the woman. Jimmy charged at the woman and stopped just before he'd hit her. I can't hit a girl... "you stupid kids!" he woman threw a pokeball and a Meditite came out. "Tite!" "Meditite, show that Chimchar who's boss!" Just as Chimchar was going to use his ember, it was chopped out of the way. "Good job, Machop!" The man had gotten up and staggered next to the woman. "That was a pretty cheap trick you pulled, but we'll get back at you." As Bandit was getting up Meditite was in a stance and was aboutt o use its Confusion attack. Just before it could, Luna came out of nowhere and bit its arm. "Tite!" Bandit jumped up and spewed embers over the Machop. Luna attacked the Medicham, and then nipped the ankles of the two Rockets. She then nudged Kiki, but at hearing no response, went back to attacking the rockets. 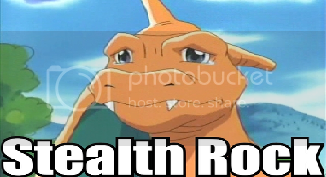 Just then, a pokemon slammed into the Machop, taking it out, along with its owner. Jimmy looked, at it surprised. "Turtwig!" The small tortoise had rammed the two over. Jacob looked over at them determined to take the rockets down. "Gah...3 vs 1 just won't do..." The woman known as Lily called her Meditite back. "I'm leaving. David, you and your pathetic pokemon couldn't even beat these kids!" She quickly ran back to the main floor and out the door. "Those Rockets...they're not gonna give up are they?" He looked at Kiki and sighed then to Jacob. "Thanks for your help, without you we would have been in trouble. 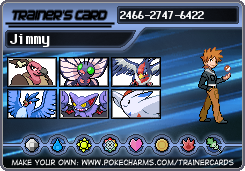 Personality: He is serious and he won't trust anyone, not even in his Rocket allies, only in his Pokemon. Background: Harken is from Pacifidlog Town. Since he was a child, Harken has been a lonely person. Also, hatred against humans was growing on him because he saw how people destroyed Pokemon homes for creating cities, while in his hometown people and Pokemon lived peacefully. Harken always wanted to find the Pokemon of his hometown legends: The Regis. So, one day he left in search of someone who could help him to find the Regis, and he found Team Rocket. Giovanni told Harken that their objective was to free the Legendary Pokemon so they will punish those who destroyed Pokemon. Harken liked the idea because he had always wanted to do that, and from since hes is a member of the Team. What Harken didn't know was that Giovanni actually wanted to control the Legendaries. I moaned and sat up, my knees coming out behind me, and rubbed my head, my right arm stayed on the ground to help myself lean. "Etai..." I moaned, and then fell back like how you would onto your bed after an exhausting day. I then moaned again and sat up. "Why the head?" I asked, and tried to get up, but fell due to lack of support and dizziness. Jimmy helped lift Kiki up. "Hey, are you okay?" Luna circled around her feet worriedly and Bandit watched from afar. Jimmy lifted her up and put her down on a nearby chair. "Kiki, how do you feel?" I slumped down on the chair, eyes closed.. "I can feel my heart pound in my head, if that helps. Oh, but besides getting hit into my mind's oblivion on the back of the head with a big bucket, I'm just dandy." My voice practically dripped with sarcasm. I opened one eye to see Jimmy look at me dryly. "You asked." I closed my eye again, and rubbed my temples. Jimmy told the pokemon to stgay with her as he walked around asking people if they had any medicine to help her. The other two returned some time later with some pills and a paper cup of water. "Here, take these." Jimmy handed her the pills and water. "You should feel a bit better after this." He smiled at her as the pokemon hopped up onto a parallel seat. I smiled my thanks and took it. My head started to clear up within a few minutes. "So....now where?" I asked, tilting my head, and letting Bandit 'brush' my hair. Jimmy shooed Bandit out of Kiki's hair. "Enough Bandit, let her rest for now." He nodded and hopped onto the floor. "Chim?" Jimmy looked down at him. "Yeah, she'll be fine." The four got up adn left the library. "So far...nothing..." Jimmy said disappointedly. "We should probably ask some of the people." "Did Blake and Jacob wander off again?" I asked, trying to focus on something else, noticing that I kept stumbling. I muttered that fact under my breath, and looked down, concentrating on moving in a straight line. However, I made it so that Jimmy would know that it wasn't for blushing or something like that. Jimmy noticed her stumbling and held her arm to keep her upright. "The two must have gone off on their own for info. Looks like we're on our own then." The two made their way to an old woman's house. Jimmy knocked on the door repeatedly. "Hold on, hold on! I'm coming!" She quickly opened the door and invited the two in. I walked into the house, and sat down when the lady let me. I held onto Jimmy's shirt. The old woman looked at us. "Ah. I'll get you two some hot coco." She left the room for her kitchen. Tugging it for his attention, I whispered to Jimmy while looking forward, "Why are we here?" He looked to Kiki. "To get information. That's why we all split up." He looked to see what the lady was doing. "Coco? Does it really take this long...?" The woman came back with the Coco, and I took some with a smile. I bowed as much as possible on a chair. "Thank you." I looked to Jimmy and nudged him. His turn. Jimmy looked at the woman. "Thanks!" He smiled as Bandit hopped onto the table and sniffed. It grimaced and jumped off making an odd face. "Bandit! That's no way to act! I'm sure this woman doesn't want you jumped all over her furniture like that." He felt that he'd made up for not bowing to her in the first place. He then asked her everything the two needed to know. I nodded along with Jimmy, going along with the information I was getting. The old woamn pointed out that there had been an odd man looking for four kids. Jimmy assumed that it was Professor Birch's assistant and thanked the woman. The two left out the door. "We need to contact the other two. Apparently Birch's helper is around here somewhere in...that direction." He pointed toward a strange looking island.